Friday was feral hot. In Melbourne the maximum temperature reached 33’C (91.4’F) in the shade. I woke up to the smell of dust in the air. Indeed, the entire house smelled of dust. That dust was the top soils blowing away with the wind from some unknown source far from here. And in some cosmic joke the maximum temperature here on the same day – in these supposedly cool mountains – reached 36’C (96.8’F) by late afternoon before rapidly cooling down again for the evening. There was talk that day of plans to continue filling the firewood shed with cut and split timber. Nature has done a great job of drying the firewood this year, so it does seem a bit of waste not to store it away for the winter! The realities of the weather intervened and those plans were shelved, and so the editor and I headed off the mountain range to undertake a whole series of errands that are required to be completed in order to keep the smooth sailing ship that is Fernglade Farm afloat! At this point I do feel it necessary to disclose that one of those errands did involve ice coffees which are an important part of adaption to hot weather. 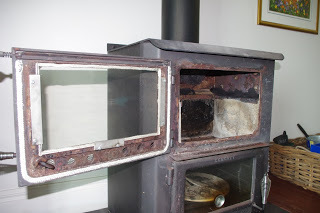 Unfortunately, it wasn’t all fun though as one of the errands involved picking up replacement glass – which had been on order – for the glass window in the wood fire box. The bloke in the local glass shop made the laconic observation to me that: “it was a strange day to be repairing a wood heater”. No doubt that he is correct in that observation. And it is worth noting for those that are numerically inclined, that for the next week not one single day is predicted to be below the long term average temperature. Later that day it was a wise option to work in the shade that day and so I did. Long term readers will recall that about a year ago I undertook repairs to the wood heater. Most of the repairs have worked well, however some new items of maintenance were required before the wood heater could be used this winter. I mean, it may actually cool down here? Maybe? Observant readers will note that in the photo above there has been an application of some black goo which is a very high temperature putty. That putty was used to replace the high temperature cement that I used last year which had since collapsed in some sections. I’m trialling the putty to see which material has the longest life in such a harsh environment. 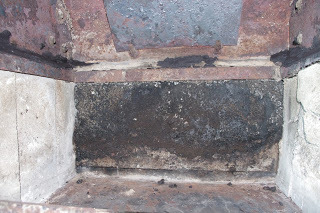 You can also see that the fire bricks on the left hand side are only a year old and looking quite good, whilst the more crumbly fire bricks on the right hand side are about six years old now and will probably have to be replaced next year along with the steel that holds them in place which is also showing quite a bit of damage. The glass in the door to the fire box had also cracked and a small section was in danger of falling out. In addition to that damage the fibreglass rope which seals the door and stops exhaust gases from escaping into the living room had broken and was in need of repair. 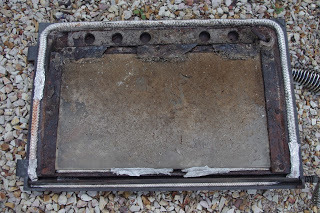 Stopping exhaust gases from a firebox from leaking into a living room is probably a good thing! Despite the hot day – and only a single large ice coffee to fuel me – I commenced repairs to the door to the firebox. All of the fibreglass ropes were replaced. At this point I should confess that the damage to the fibreglass ropes was my fault because on my previous repair, I had not realised that a very high temperature glue was required to hold the fibreglass ropes into place in the steel channels. Many things are obvious from hindsight! 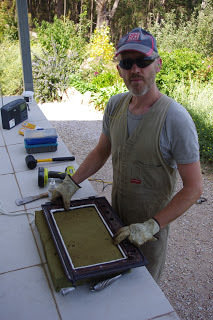 The author undertaking repairs to the door of the wood heater – having only had a single ice coffee! The steel that holds the glass against the door had shown considerable damage in just one year and that was part of the reason why the glass actually cracked. Some people may believe that glass is a very cheap product, but this high temperature glass is very expensive at almost $1,000 per square metre (10.7 sq ft)! You can tell that you are being supplied with the correct glass because if you look down any side of that glass it will show a pink hue rather than a green hue. Regular readers will know by now that I’m as tight as when it comes to unwanted and unnecessary expenditure and I was really annoyed by how quickly the glass broke (one year). A little bit of Internet research then took place into steel. And who would have thought it but apparently not all steels are the same. So, I replaced the chunks of steel holding the glass against the door with what is technically known as 316 Stainless Steel flats. Apparently that stuff is very resistant to high temperatures and the steel seriously distinguished itself in my presence by destroying umpteen number of drill bits (even cobalt bits). Whatever, it impressed me as being a very hardy material and I shall check back in another year and see how it has progressed in the harsh world of the fire chamber! Hopefully the weather cools enough one day in the far future (maybe in a galaxy far, far, away) so that the wood heater can actually be used and the repairs get tested? 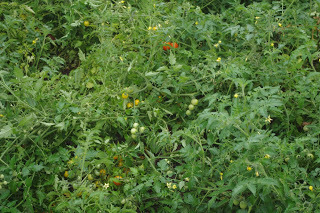 Long time readers will recall that the tomatoes were planted into the berry bed because, well, the tomato bed – despite best intentions – hadn’t yet been constructed. This is a good thing because the berry bed is such a great location for growing tomatoes that the berries have been given the boot to the soon to be constructed spot that the tomatoes would have been grown in! 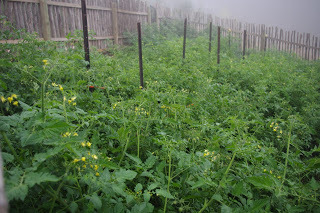 It was a sheer accident that has yielded a significant increase in the number of tomatoes harvested and we believe that the difference is due to an additional few hours of strong sunlight per day compared to where they were planted in previous years. Plus a much better watering regime as well (five to ten minutes per day of overhead watering across the entire enclosure). 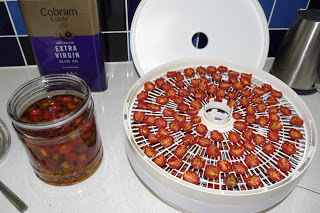 We can’t possibly eat that many tomatoes, so each weekend the dehydrator has been running hard with at least six trays of ripe tomatoes which are then stored in olive oil for use later in the year. The olive oil doesn’t go to waste either as it will be used in cooking once the tomatoes are consumed. 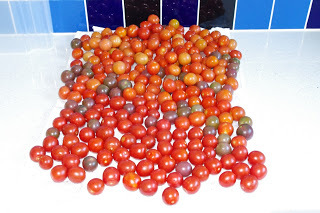 As the tomatoes are harvested, some of the seed is processed and saved for raising as seedlings when August (February for northern hemisphere folk) rolls around later this year. Processing tomato seed is very simple. I scoop the seeds into a glass jar with water where they sit for one to three days. 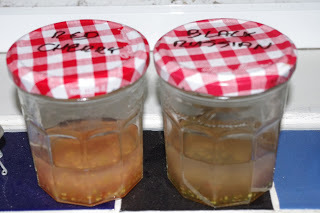 In those days the natural yeasts tend to kill off any nasties that may spoil the seed and it also breaks down the furry outer coating of the seeds. Once some bubbles appear at the top of the water, it is drained and the seeds are left to dry on paper or a paper towel. Once the seeds are dry, they can be stored in an envelope. The tomatoes here are in their fifth season and they rock! The improved (and more efficient) watering system of a dripper hose for about ten minutes per day in the raised garden beds has yielded incredible results over these past few months. From right to left the raised beds include: Asparagus; Scritchy; Nasturtium; Perennial Spinach; Perennial Rocket; Tomatoes; and herbs. Despite the heat, we have continued to fill the original firewood shed with seasoned, cut, split, and dried firewood. It is really hard and hot work when the sun is beating down on your head, but it has to be done too. I have a suspicious feeling that autumn will be non-existent this year and we will progress from summer to winter with no in-between season. Now, I must say that I appreciate the many comments I have received over the years supporting the fact that I am tight with money and hate waste. I appreciate all of your encouragement as I really do hate waste – it annoys me! And so in recent months my rage against the machine has been focused on smoke alarms. Smoke alarms are wonderful devices and they have probably saved countless lives blah, blah, blah. However, like the good fictional people at the Sirius Cybernetics Corporation who are described as: “a bunch of mindless jerks who’ll be the first against the wall when the revolution comes” so too are the good people who designed smoke alarms. You see my beef with smoke alarms is that I’m required to have two of them installed in my house. Fair enough too, the devices save lives – I mean who can argue with that? Except the little rotters require replacement 9V batteries which only last about half a year. So every year, I have to replace four batteries for the life of the smoke alarm and that seems an extraordinary amount of waste to me. 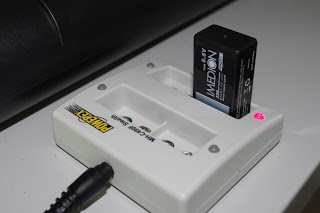 The smoke alarm devices in most new houses are connected up to the mains electricity grid so an in built electronic circuit for a rechargeable battery seems like a no brainer to me. But do any smoke alarms actually perform that function? No. Anyway, I thought to myself, I can outsmart this waste and a few months back I purchased a rechargeable battery only to find that it was 7.2V (not 9V) and the smoke alarm device kept beeping at me just to let me know that the battery was apparently flat because the voltage was low. However, with a bit of hunting around and assistance, I came across a company that produces rechargeable batteries that are long lasting and rated to 9.6V. Once installed into that pesky and stupidly designed device, all is now quiet! The temperature outside now at about 8.00pm is 17.1’C degrees Celsius (62.8’F). So far this year there has been 61.8mm (2.4 inches) of rainfall which is up from last week’s total 57.8mm (2.3 inches). Last Wednesday the 9th March produced yet another record breaking temperature. This time, the weather delivered the warmest overnight low temperature for March in Melbourne in recorded history. Well done! At 7.30am on that Wednesday morning in Melbourne the night time air finally cooled to a low of 29.1’C (84.3’F) and it was strangely humid too. 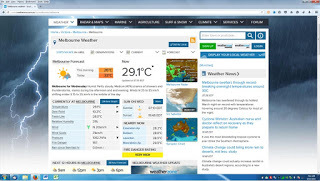 A screen shot of the weather website showing the temperature early Wednesday morning 9th March. It was feral hot! Fortunately, the air temperature here was a bit cooler as I’m up in the forested mountains north of Melbourne. The farm is about 700m (2,300ft) above sea level so it is usually much cooler than Melbourne, although occasionally it can also be hotter when Melbourne is enjoying a sea breeze which lacks the strength to penetrate this far in land. The European honey bees have been enjoying this hot summer and on that hot Wednesday morning there were plenty of worker bees enjoying the cooler air on the outside of the hive. It was probably quite warm to hot inside the hive boxes! 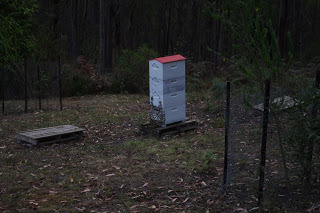 Bees are very clever insects and they are able to maintain a constant temperature inside the hive by co-ordinating their activities, so in all likelihood the bees on the outside of the hive box were probably fanning fresh cooler air into the centre of the hive. The rest of the Wednesday was hot too. By Wednesday evening, the air temperature cooled down a bit. And by Thursday, a gentle rain fell for the entire day and then every day since then a little bit of rain has fallen. It looks as though the endless summer has finally left the building! 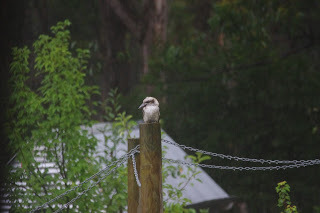 And the wildlife that lives on the farm spent much of that Thursday enjoying the rain rather than sheltering from it, as they usually would (with the notable exception of the kangaroos which seem to enjoy being drenched with the rain). The recent rain has coincided with the Jerusalem artichokes producing their flowers and they now look to me like giant daisy flowers. Observant readers will note that the Medlar fruit tree which is slightly to the right and behind the Jerusalem artichoke plant is producing some orangey-brown fruit which will be harvested in a month or so. Also to the left and below the Jerusalem artichoke there is a large patch of basil mint in flower which the bees have been busily harvesting the pollen from recently. 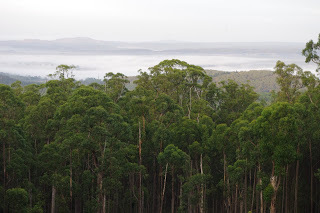 The abrupt change of the seasons has also brought increased humidity across the mountain range and valley below and that has meant that most mornings I’m greeted with an eagle’s eye view of the fog collecting in the valley below. There are only so many home grown, tasty, sun ripened tomatoes that a person consume. It’s a real problem! 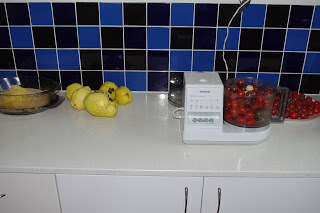 So in addition to eating and giving away fresh tasty tomatoes, the editor and I have also been dehydrating the fruit and then storing them in olive oil for consumption later in the year. The food dehydrator has been getting a serious workout over these past few weeks. I estimate that so far we have preserved at least 20kg (44 pounds) and should easily double or even triple that over the next few weeks. I feel compelled to add that the dehydrated tomatoes added to an Ortolana sauce (Ortolana refers to seasonable vegetables) and gnocchi tastes superb! The olive oil will eventually be used in cooking too – perhaps drizzled on freshly baked bread? YUM! 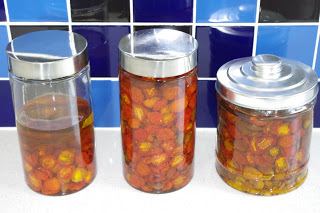 Our modest collection of dehydrated tomatoes stored in olive oil – so far! We underestimated the quantity of big jars required for this preserving process and will correct that over the next week or so. In fact, it is also worthwhile mentioning that the kitchen is now full to bursting with preserved and bulk goods. My office which I work from now has racks full of slowly ageing wines as well as bottles of jams and chutneys. There is even a large bin full of organic rolled oats behind me as I write this entry. The preserving activities have even extended to the shed closest to the house where bottles and jars are stored as well as other goodies. I suspect that something will have to change in the kitchen over the next few months. It is also worth noting that I am in total awe at the sheer complexity as to how these processes must have been managed on a small holding as recently as a century or two ago. 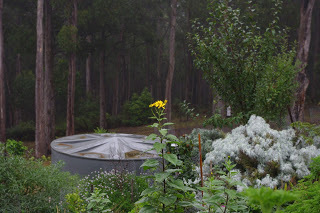 With the return of the rains and the abrupt switch to cooler weather, the editor and I have been considering ways to get even more rainfall to infiltrate the soil. Over at the western end of the farm, a swale at the very top of that orchard collects any rainfall from the road into a swale. A swale is a fancy name for a ditch which collects water and allows it to infiltrate into the ground slowly. Once water is stored in the ground it is less likely to evaporate in the hot sun and it becomes available to all of the trees below the swale. And more importantly, water takes a very long time to slowly move through soil. The editor discovered recently that on the eastern end of the farm, there is concrete drain under the road (the technical name for this is a culvert) that we’d never noticed before. The reason that we’d never noticed the drain was because it was completely covered in the invasive Cane Needlegrass (or for the more learned amongst the readers here: Nassella hyaline). 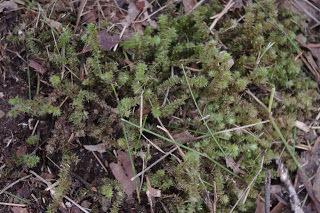 Tell-tale signs of the drain and possible underground water were there to be seen in that area too as many broadleaf understory and moisture loving species of plants were present downhill of that drain. 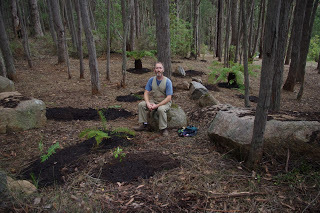 The editor and I decided to plant a rainforest gully downhill of the recently discovered drain. The plants in the rainforest gully will ensure that any water that exits the drain is quickly infiltrated into the soil instead of running over the land and ending up elsewhere – plus a fern gully just looks nice! Did I mention that the drain is also located uphill of the more sun drenched of the two orchards here? Before we could begin the task of planting out the rainforest gully, we had to first spend an entire day chopping and dropping every chunk of invasive plant in that huge area. That was a massive day of work, but at long last it was finished. 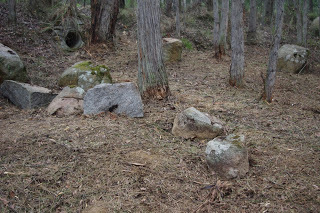 There were already a couple of large rocks near the drain however we also rolled a few more rocks into that area which were placed into the possible flow of water as well as with aesthetics in mind. The rocks perform the function of slowing any water that moves across the land which increases the possibility that it will be quickly absorbed into the soil. Observant readers will note that the damaged bark at the base of the messmate trees (Eucalyptus Obliqua) which shows just how invasive that needle grass was. The following day involved breaking quite solid clay and planting out the first of the many local rainforest species into the flow of water from the drain. 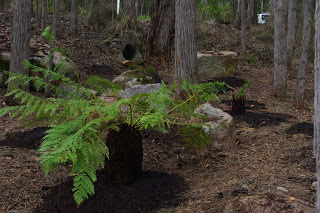 The local plant nursery supplied many of the tree ferns which were planted into a mix of the local clay and composted manure. As a funny side note, the local nursery had decided to distinguish between the thinner and thicker species of tree ferns by using the very politically incorrect terms: Fatties and skinnies. I believed the slightly more expensive “fatties” to be a more drought hardy and resilient species and so opted for those. Tree ferns are a very old and interesting species of plant. I noted that the fronds of the plant grow so that they collect and direct falling organic matter into the core of the trunk for consumption by the plant. Also, I noticed that when watering the tree ferns on top of the plant, the water disappeared into the core of the trunk which is clearly an excellent drought survival strategy in that the trunk works in a similar way to a sponge. Autumn, I have observed is the time to plant new trees in a temperate climate such as here. The ground still retains some of the summer warmth and hopefully the regular rains have returned. Many of the fruit trees that I relocated in the depths of winter last year died over this astoundingly hot and dry summer and so the next few weeks are crucial to getting new trees into the ground and/or relocated from elsewhere. By winter it will be too late for new trees to get established well enough to survive a brutal summer. 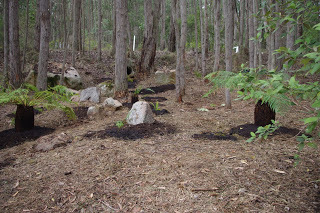 With that concern in mind, over the next few weeks, we will continue to plant out additional over story and under story species into the rainforest gully and hopefully they will be well established and hardy enough to get through the next killer summer – which for now seems to have thankfully gone elsewhere (for the moment anyway). The temperature outside now at about 8.00pm is 11.7’C degrees Celsius (53.6’F). So far this year there has been 80.4mm (3.2 inches) of rainfall which is up from last week’s total 61.8mm (2.4 inches). Living with the wildlife here can sometimes be like co-existing with a band of marauding barbarians! The defences for the various plants are constantly tested for vulnerabilities. Any weaknesses in those plant defences are ruthlessly exploited by the wildlife. And the wallabies are the most ruthless of all of the wildlife here. Honestly, the average wallaby could teach Alaric I (who is famous for sacking Rome in 410 AD) a trick or two about breaching defences! Wallabies are like a slightly smaller kangaroo but with darker fur and a more stout build. They also differ from kangaroos in that they are generally lone creatures, whereas kangaroos hang around in groups (called mobs). Most nights there are a couple of wallabies bouncing through the orchard and garden enjoying safe access to feed and water. The rains and cooler weather have returned after the seemingly never ending hot and dry summer. In a few weeks there should be green growth everywhere. Autumn is similar to spring but usually much shorter and cooler. However until the green growth returns in abundance, the garden and orchard are the primary source of feed for the wildlife living here. Sometimes however, it can be a bit difficult for me to reconcile the cute, and mostly harmless wallabies with the sheer amount of damage they can achieve in the garden and orchard in only a single evening! Every day this week, I’ve discovered new and ever more ingenious outrages that the wallabies have committed in their quest for access to the best feed! Over the years, many people have advised me that hoop houses are a great idea. A hoop house according to Wikipedia is “is a tunnel made of polyethylene, usually semi-circular, square or elongated in shape” that contains garden beds. They certainly sound like a good idea, and down under the hoops that hold the roof vertical in a semi-circular state, are generally made from very strong polyethylene piping. 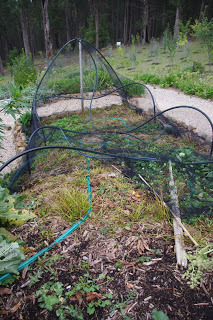 I did have a hoop house over the strawberry bed but instead of the plastic covering, I used very heavy duty black bird proof netting to keep out the pesky parrots and other creatures from stealing the strawberries. 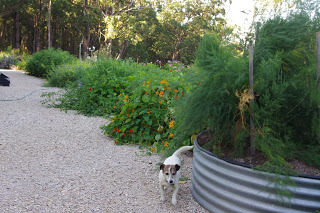 It is worth mentioning that over the years I have discovered to my horror that everyone (including visitors) and everything else loves strawberries, even the dogs, whom are technically meant to be on my side, but if given the opportunity, will steal the strawberries from that garden bed. This week however, the wallabies finally breached the outer defences of the strawberry bed and completely ransacked the strawberries! Alaric I would have been proud of the wallabies ransacking efforts! 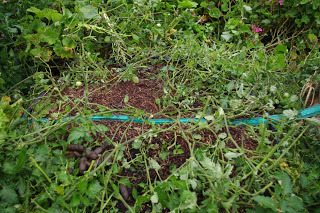 The wallabies cunning plan for ransacking the strawberry fruit and plants involved jumping onto (remember they can bounce exactly like a kangaroo) and squashing the polyethylene pipes flat to the ground. 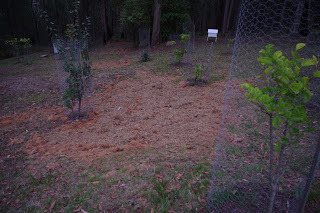 Once the pipes were on the ground, the wallabies then proceeded to rip holes through the supposedly heavy duty bird netting so that they could consume the autumn strawberry fruit as well as most of the plants. The strawberry enclosure fell to the marauding invaders this week much as Rome fell to Alaric I and his band of marauding wallabies – sorry, I meant Visigoths – way back in 410! Marsupial animals whether they be kangaroos, wombats, or wallabies all enjoy the plant French Sorrel. French Sorrel is among the more reliable summer greens and the plant shrugs off the worst of the hot and dry conditions which are a normal part of the summer weather here. Unfortunately, the various marsupials enjoy that plant so much – wherever it is grown on the farm – that I rarely get to consume any of the leaves. 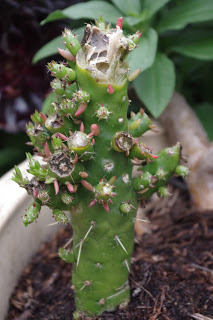 The wallabies even developed a taste for succulent plants and to the editor’s utter horror a wallaby had left twin foot depressions in the soil of one of the succulent plant beds. 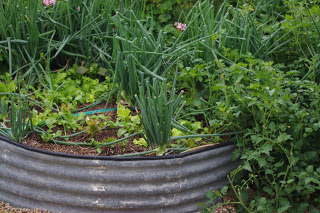 Even the onions are not safe as the wallabies have been eating the very top of those onions. Fortunately the plants will regrow! Maybe the wallabies were after a solid dose of Vitamin C from the onion leaves? Even the unpalatable fruit trees aren’t safe at this time of year. Usually no animal can stomach citrus leaves, but a hungry wallaby will happily undertake the experiment and thus even lemon trees are not safe! 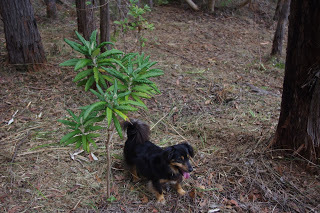 Fortunately, the wallabies are no longer able to enter the tomato enclosure because I’m reasonably certain they would eat the tomato plants and fruit and it is worth mentioning that the average wallaby can survive on a diet comprised of 85% bracken fern. That diet would poison and kill most livestock! 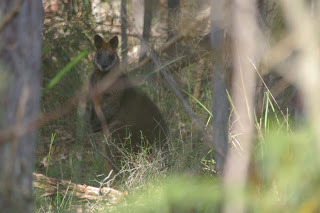 Wallabies are formidable beasties! What were we talking about? Oh, that’s right, tomatoes. It has been the best year for tomatoes that I have ever experienced. We managed to get everything exactly correct this year for the tomatoes, from fertilising, the positioning of the plants for maximum sun, and even the watering cycle. 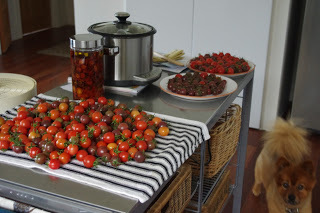 The quantity of tomato fruit we are picking this year is so far beyond our expectations that it is a fair thing to say that we are drowning in tomato fruit. This week we have dehydrated 12 trays over two long days of tomatoes and still we have fruit left over! All of the dehydrated tomatoes are stored in quality olive oil for consumption later in the year. A regular commenter last week raised the concern that the dehydrated tomatoes stored in olive oil poses a very real risk of contamination by the bacteria: Clostridium botulinum. As a general note, it is not the bacteria that makes people quite ill (or it can also be fatal – seriously), but the neurotoxin botulinum which is produced by the bacteria. It is no laughing matter because according to Wikipedia that neurotoxin is the most potent toxin known to humankind, natural or synthetic, with a lethal dose of 1.3–2.1 ng/kg in humans. That is some seriously scary business. However, as an interesting side note that neurotoxin is the same rubbish that some people have injected into their faces to smooth wrinkles and deaden facial nerves under the common name “botox”! I once knew of a lady that had that stuff injected into her face and her face became so immobile and incapable of expression that apparently a joke was told that you could tell that she was angry because she blinked a lot! Preserving foodstuffs always carries risk whether it is done at home or via the industrial food system and Clostridium botulinum is even sneakier than most bacteria because it does not require oxygen (contact with the air) in order to do its thing (the fancy name for this is anaerobic). The dehydrated Black Russian tomatoes were even more acidic with a pH of 3.0. The important thing that I take away from this experiment is that not all tomatoes have the same pH and perhaps it would be wise for an individual to know whether the particular tomato variety is a high or low acid variety before attempting any preservation. It is also worth noting that many of the varieties of fruit and vegetables grown these days are not very acidic, but I have read anecdotal accounts that just because a fruit is labelled “heirloom” or “heritage” does not necessarily mean that it is an acidic variety either. I believe that it is also important to recognise the risk and understand the contributing factors to that risk and then choose to accept that risk. 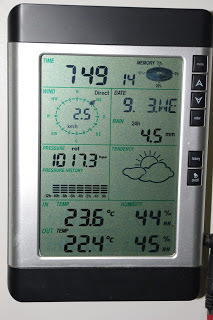 The rains this week brought two days with very low temperatures where the maximum day time temperature barely reached 12’C (53.6’F) with even cooler night time temperatures. By the second day of those conditions, we had decided to light the wood heater for the very first time this year. And after all of the recent repairs to the wood heater, as well as the major cleaning of the flue (the fancy name for the steel chimney), the heater worked brilliantly and the house was warm, the quince fruit were poached to perfection, the bread was baked, the water was heated, and Poopy the Pomeranian (who for the pedantically minded is actually a Swedish Lapphund) started complaining about all that heat in the house! 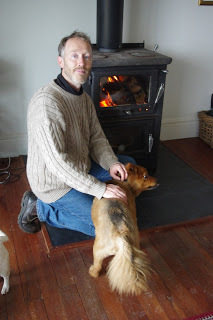 The editor and I have used firewood for heating and cooking during winter for almost half a decade now. Even after all of that real world experience we have absolutely no idea at all how much firewood we use in a year. The reason for that lack of understanding is that each year we have been slowly altering/improving our firewood systems so that they actually work given the weather conditions that prevail at the farm. Last year we completed the first of the firewood sheds. 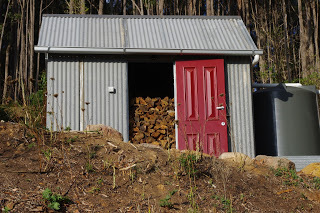 Earlier this year we converted the old chicken shed into a super dooper firewood shed. And this week, after a huge effort, both firewood sheds are now completely full with cut, split, seasoned and dried firewood ready to use. 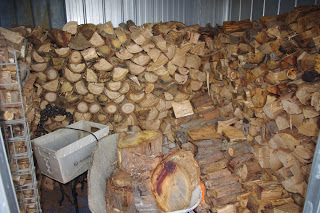 It is very exciting to have access to so much ready to use firewood and in another eight or nine months I should be able to tell you – the readers – exactly how much firewood I use in this year. It is a bit of a relief to have that job almost finished and I’m secretly hoping that I have one and half years firewood stored under cover and out of the weather in those two sheds. The temperature outside now at about 9.00pm is 12.2’C degrees Celsius (54.0’F). So far this year there has been 110.6mm (4.4 inches) of rainfall which is up from last week’s total 80.4mm (3.2 inches). Easter is a great time. The daylight hours are long and the weather is cooler because it isn’t quite summer, but it isn’t quite winter either. The weather is just nice. And I did notice that lot of people were also enjoying the long weekend that is Easter and because the local café was far busier than usual. And unfortunately that is when a minor note of unpleasantness creeps into an otherwise pleasant Easter. Anyway, disaster struck early on this Easter as the local café had run out of their supply of really excellent hot cross buns. The buns were good too and worth getting out of bed at some ungodly hour of the morning just to pay my culinary respects to. What a total disaster for us as there were no hot cross buns to be had! It is worth mentioning, that not all hot cross buns are good. In fact, some hot cross buns for sale are pretty ordinary tasting. 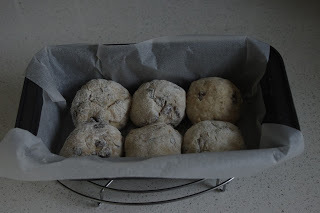 Over the past decade, I have baked many different breads, cakes and biscuits and so I thought to myself: How hard can a hot cross bun be to make? 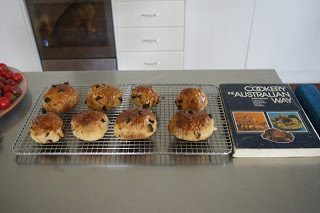 I also considered the more practical aspects of the hot cross bun situation if I made them myself – in that I don’t have to get out of bed as early and the editor could also enjoy a well-earned coffee and hot cross bun delivered to her in bed in the morning. Everyone wins with that arrangement! Most people have a secret skill or hobby, and mine is baking. Seriously! I really enjoy baking breads, cakes, and biscuits and I rarely receive complaints from the people consuming the end product and often they will reminisce at a later date about a much earlier bread, cake, or whatever. On the other hand I’m a dilettante because I’ve rarely put much effort into the art of baking. You see, the truth is that the hours that bakers work, really never appealed to me as a possible career option. But there is also a darker side to my baking hobby because when I lived in the inner city of Melbourne I was surrounded by many of the finest boutique bakeries in the entire city, and it was really weird but, many of those same bakeries used to occassionally provide me with additional free quality produce along with my purchases! It was uncanny and I was totally spoilt. Alas such days are in the past now and don’t help me because despite my best wishes, there appear to be no hot cross buns to be enjoyed at the local café! 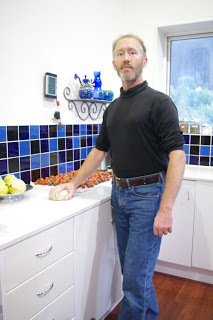 The author kneading the hot cross bun mix on the kitchen bench. Note more tomatoes are in the background! I’ve never made hot cross buns before and they ended up being very tasty (after a few minor experiments). The six hot cross buns in the photo above were of a perfect size and consistency (for those that are technically inclined I used a kitchen scale to ensure the evenness of the buns), but unfortunately they were all consumed by guests today before I had a chance to even get a photo of the finished result. An earlier batch of freshly baked and glazed hot cross buns. Oh, they’re good! One lesson that I have learned from producing hot cross buns is that they are tasty because they contain useful amounts of fat, sugar and spice (and all things nice!). Certainly that is a good thing and anyway, I always cook with quality ingredients as life is too short to be consuming rubbish food. 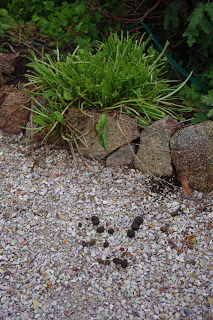 Observant readers will note two things in the above photo: Firstly, we can play the game where is Poopy? 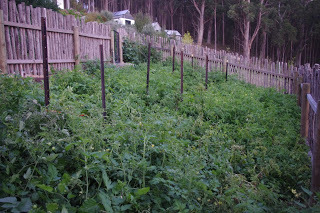 ; and secondly you may notice even more tomatoes! Actually from here onwards let’s call the hot cross buns by their actual name which is technically a “fruit bun” as the Devil probably would be very uncomfortable with the name “hot cross bun” due to its religious overtones. 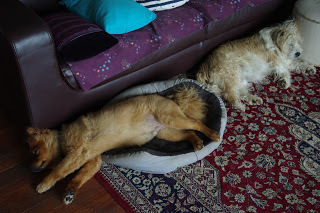 Anyway, by now you the reader are probably thinking that living on a farm during Easter is all about baking and eating fruit buns, but you would be completely incorrect in that assumption unless of course you are a dog and the weather had turned cooler and outside conditions were sub fluffy optimal. All that firewood that the dogs are enjoying does not make itself, and the editor and I finally filled the very last storage bay with another long day of chopping, splitting and hauling firewood. 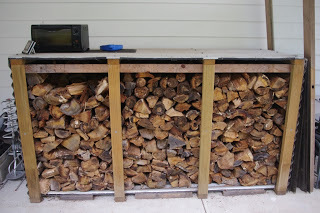 I’ve mentioned on the blog before that I have absolutely no idea how much firewood I use in any one year. This year I am absolutely determined to discover just how much firewood is required for a year and knowing that metric will help me properly manage this sustainable fuel source well into the future. One of the interesting things about processing trees which were felled many years ago so as to produce firewood, is that the process produces a huge quantity of excess organic material (comprising of bark and other fine materials). Regular readers will know by now that I loathe waste. 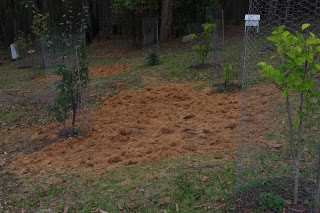 All of that excess organic material was moved this week into the orchard and I used it to fill in holes left from giant trees which have fallen to the ground well before any of us reading this blog were even born. 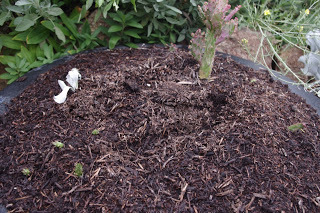 I also add compost on top of the excess organic material too so that bacteria and fungi can assist with the process of breaking down that excess organic material. One of my (edit: many) weaknesses is that I suffer from mechanical sympathy. However, the Devil could spare no mercy this week on the trusty old Honda push mower which has been used for the most appalling jobs on the farm and despite the fact that it is very long in the tooth and the aluminium case has even cracked slightly, that machine still keeps working hard. And so the trusty old Honda push mower was used to break up the excess organic matter into much smaller pieces. 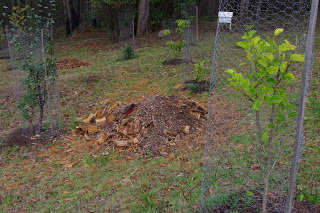 Once the organic matter has been broken down into smaller pieces it has a huge surface area and the soil life will quickly convert it into quality soil which will then feed the fruit trees in the orchard. And perhaps with extra fruit on the fruit trees, I’ll then be able to make even more fruit buns? 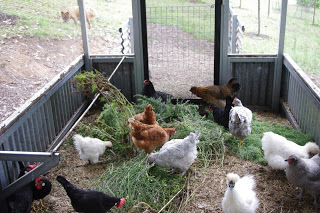 The chickens provide a top coat to those now flat lumps of excess organic matter because I took several loads of their deep litter mulch from the chicken enclosure and threw them on top of the piles of excess organic matter. 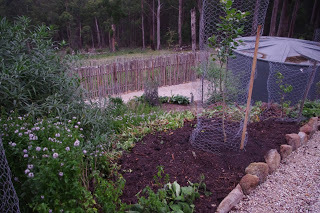 Easter is also a massive time for planting and pruning and over the past week the editor and I have probably spent about 60 hours combined working on the farm (including the firewood). 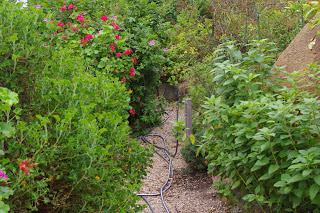 Some of the paths had become impassable because the plant growth over the past few weeks had been that feral with the small amount of rain and the drop in the intensity of the UV. The prunings that were inedible were used as organic matter and fill on newer garden beds as food for the soil organisms. 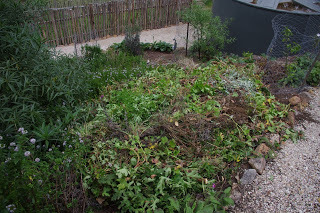 Over the top of all of those prunings in the new garden bed, I added one cubic metre (1.3 cubic yards) of a mix of compost and composted woody mulch. 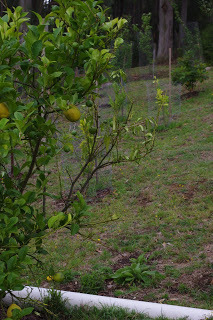 Into that mix I then planted a number of citrus fruit trees. In case anyone was concerned about the ongoing welfare of the wallabies after last weeks blog showing just how destructive they can be, I can assure the concerned readers that they have since acquired a new taste for tomato leaves and stalks and were even nice enough to leave another calling card! 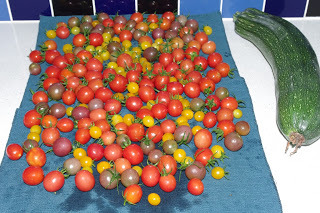 It wasn’t all fruit buns because I have never before had access to so many tomatoes! Unfortunately, Easter was cloudy and I was unable to run the food dehydrator, due to lack of electricity generated by the solar PV panels and instead decided to produce passata (which is a form of bottled / canned tomato with salt). The harvested tomatoes were blitzed in the food processor. Don’t feel sorry for them as there are plenty left to harvest! And the result of the long process of blitzing, salting and bottling (and also don’t forget the long hot water bath for the bottles so that they seal properly) was 29 bottles of passata (5 of which are now in the freezer). We have grown so many tomatoes this year that we have the opportunity to try many different varieties of preserving methods and then observe how long each of those methods preserve the fruit. 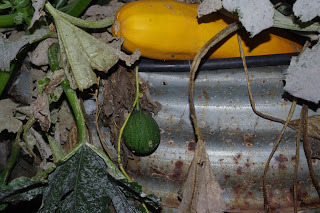 As a hint the fruit may possibly be a round cucumber (Chris’s choice) or a melon (The editors choice). This one is a complex problem, so if you dare weigh into this debate, be prepared to provide evidence! The temperature outside now at about 9.30pm is 10.3’C degrees Celsius (50.5’F). So far this year there has been 114.8mm (4.5 inches) of rainfall which is up from last week’s total 110.6mm (4.4 inches).